Support Home Paya Virtual Terminal How To How to remove the page header and footer from Virtual Terminal receipts. How to remove the page header and footer from Virtual Terminal receipts. Can I remove the page header and footer from my Virtual Terminal receipts? Most browsers will include a header and footer on pages printed from the internet. Usually these include information such as the page title, URL, date and page number. These can be disabled on both an individual and permanent basis. Note: this article provides directions in Internet Explorer 9. The process may vary slightly in different versions of Internet Explorer, and significantly in different browsers (such as Mozilla Firefox or Google Chrome). 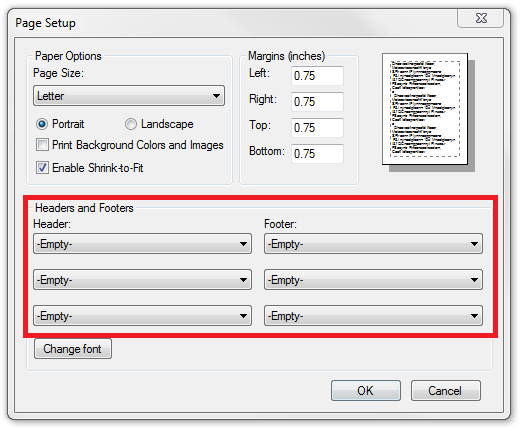 In Internet Explorer, select Print Preview from the File menu. Use the button outlined below to disable headers and footers, and then use the left-most button to print. How to set up recurring transactions in the Paya Exchange Virtual Terminal (PEVT) or VT3.